Now that you know where the pins will go once you remove them, you can finally take them out of the connector. 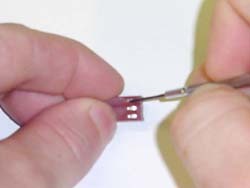 To do this, you need to insert your screwdriver or paper clip into the holes on the side of the connector and push down the small tab locking it in place. 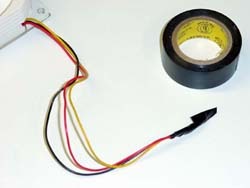 To prepare the pins for the sleeving you should wrap them in electrical tape. This will keep them together and keep them from snagging on the sleeving. 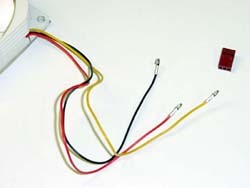 For really tight sleeving you may want to stagger the pins so that they are not all in one big bunch under the tape. Now you will need to get the sleeving ready. First, decide how long the sleeving will need to be. 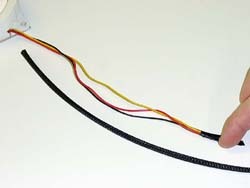 You want the sleeving to be about 1.5” to 2” shorter than the actual length of the wires. 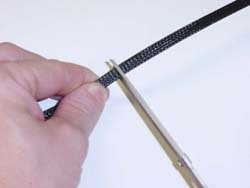 The shorter length allows the heatshrink tubing that we will apply later to cover the ends of the sleeving correctly and still allow flexibility. Using your scissors cut the sleeving to the desired length. Here is the sleeving after it has been cut. 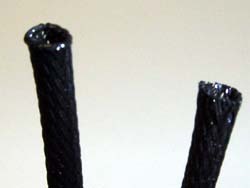 Notice the fibers that make up the sleeving. 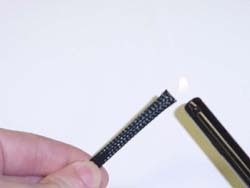 The ends of the sleeving where you just cut it will fray very easily, so you will need to lightly burn the ends to melt the fibers together with your lighter. 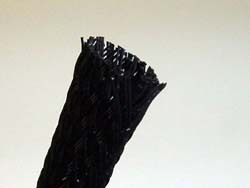 Do not get carried away, but make sure there is enough melted to hold the fibers in place. After you have completed prepping the ends of the sleeving you should notice the difference. On the left is the finished sleeving and the right is unfinished.